American Standard has been in the sanitary wares industry for a long time, which only ensures their attention to quality, and the longevity of their products. They have brought about the change in accordance to the needs of the normal public, and their catchphrase of introducing the American standard in at least three of every five homes in the United States of America has definitely been a successful venture. There are countless hotels, stadiums, as well as public locations that have made use of American standard toilets, which go to see a lot about the quality and the kind of a brand that they have been able to bring themselves to become. In this American Standard review you would see that efficiency has become the key in each and every product of sanitary ware that they bring up to the market. With that said, one could only expect a lot from the American Standard H2Option Siphonic Dual Flush Elongated Two-Piece Toilet. H20 dual flush system: -With this new option incorporated into this particular model from American standard, you find that you could save water without having to sacrifice on the performance of the waste disposal system in this best rated toilet. It is actually controlled by an actuator which is in the form of a dual flush, and it features a 1 gallon per flushing option, which in fact uses 25% less water when compared to other flushing activities. This ensures that you could handle about 1 kg of solid waste with just a single flush, which is extraordinary for any toilet. 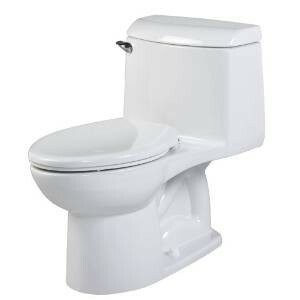 Rim Wash: – The American standard toilet features a pressurized rim. What does it signify? Well, in the Rim chamber, the water is fed from the flush tank, thereby trapping the air inside. This causes a pressure in the chamber, and when the pressurized water is discharged from that place, it can completely eliminate any kind of dust or dirt from the rim of the toilet. Super powered siphon: – In true necessity in the entering of the water in the bowl of the rim, water should also be dispersed effectively. So, the super powered siphon has been maintained at a water level so as to get through everything in a single flush, to provide a clean bowl for the use by the next person. The American standard Dual Flush Elongated toilet is effectively a two-piece variety, thereby making it extremely easy for you to clean and maintain. So, when it comes to the installation, you have to make sure that it is floor mounted. Since the toilet will come pre assembled, all you need to do is to create a hole in the floor that will be directly connected to the p-pipe in the wall that leads down to the sanitary disposal. Otherwise, if this is way too technical for you, hire a plumber to get the job done. It contains a 12 inch rough in for better comfort and stability of the toilet. It has been certified by WaterSense, making it a reliable product. The pushbutton actuator is chrome plated, making it exceptionally good to look at. The action consists of a dual flush toilet, making for a highly effective with disposal system. It also comes with an elongated two-piece siphonic action for better waste disposal management. The size of the toilet bowl is elongated and beneficial for the people with a moderate to a tall height. The material is made out of vitreous china, which is not only extremely robust, but also can be easily maintained. It is floor mounted, making it very easy to install. Water consumption is only 1.6 GPF or gallons per flush. This is extremely low when you compare it to most of the other contemporary double flush toilets, thereby giving it an advantage in terms of water consumption and conservation. It has a limited two-year warranty, ensuring for a quality guarantee and effective after sales service. It has a permanent ever clean surface, which is a technology used by American standards in order to protect the toilet from any kind of mold formation, mildew fungus and algae that can cause any kind of declaration or any type of stain. With minimum effort, the surface will be able to keep itself clean and stay clean for a very long time. This toilet comes with a standard dual flush elongated toilet as well as bolt caps of two color varieties. Getting this toilet in other parts of the world can prove to be a problem, as there is limited stock applicable in various online and off-line stores due to the high demand of such toilets. The installation needs an experienced plumber, or else you could end up getting a malfunctioning toilet. Since the bowl is elongated, people with a short height can have some problems being comfortable defecating. Priced at only $263, this particular toilet from American standard has definitely hit the ball out of the park. This is certainly worth a look at in case you’re looking for a double flush two-piece toilet to adorn your bathroom.